Powerful, large, loud and aggressive. 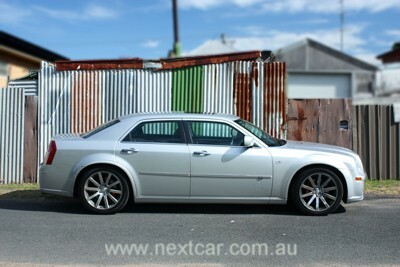 Chrysler's flagship 300C SRT8 favours presence over subtlety. It's more like a hot rod than a luxury sedan. From the outside, the aggressive styling sets out its intentions – particularly the massive 20 inch forged alloy wheels and the lowered stance. Underneath, its 'trump card' is the 6.1 litre V8 engine pumping out 317 kW of power and 569 Nm of torque. Whilst this statistic doesn’t beat the European super sedans, it is still competitive and the SRT8 comes at a fraction of the price of the Europeans and, additionally, this doesn’t get in the way of it being serious competition for the locally produced V8 sedans. The V8 gives an addictive rumble on command when the start button is pushed. The tone that booms out from the stainless steel exhaust is deep and loud. Its appeal should be listed on the spec sheet! The power is abundant, but the throttle is easily managed around town for safe and friendly driving. That’s a good thing for the wallet too. As is usual, the bigger the engine, the bigger the fuel consumption. In this regard, the SRT8 strikes a compromise with claimed fuel consumption of 14.0 litres of unleaded per 100 kilometres driven on the combined cycle. This number jumps to 21.0 litres of fuel per 100 kilometres of city driving. I restrained myself in an effort to verify the factory fuel consumption data but failed. My result was consumption of 16.1 litres per 100 kilometres travelled based on a mix of city/highway driving. Power hits the ground via rear wheel drive and acceleration from 0-100 km/h apparently takes low 5 seconds according to Chrysler and the SRT8 will continue to accelerate to a claimed top speed 265 km/h. To keep you interested, this car comes with some curious trick features that are mostly restricted to track conditions like lap timer, acceleration timer, brake distance measuring and g-force measurement. Not only does the car have great acceleration, but it has stopping power to match thanks to brakes by Brembo including massive ventilated rotors and Brembo 4 piston callipers front and rear. The callipers are powder coated red and help to spell out this cars sports presence. The SRT8 also differentiates itself from its more sedate 300C 'brothers' with the inclusion of a neat boot lid spoiler and trimming around the wheel arch – both giving the car a sporty presence. The SRT8 sits 13 mm lower than other 300C models and offers a firmer, more responsive ride without being stiff or impacting comfort. Its not agile - more of a dragster than track day special. With size comes weight and the SRT8 tips the scales at 1,920 kilogrammes. The drivetrain includes a 5 speed automatic gearbox that allows clutchless semi-automatic gear changes. All Chrysler 300C models have automatic transmission. On the inside, there is plenty of luxury equipment to ensure the spec sheet is extensive. The interior, however, is possibly the part of the car most in need of an overhaul. The seats are great and offer plenty of comfort and can be adjusted as you need. The seats are trimmed in dark slate grey leather and the front seats are heated and electrically adjustable. No trim choices are available but you do get plenty of leg room and excellent overall comfort for passengers seated in the rear. There is plenty of leather in the cabin but equally, there is plenty of plastic. 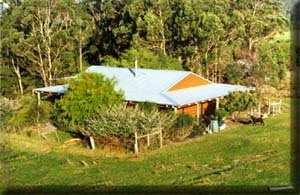 The cabin is functional and has plenty of equipment but just doesn’t inspire great expectations of the car as a whole. The dash still gets a retro analogue clock mounted in the centre and the steering wheel is so big it could probably work well in a bus. But despite these minor shortcomings, this is still a car you will enjoy driving. Again, the seats are excellent and the car is loaded with equipment. The 300C SRT8 comes standard with Chrysler’s MyGIG multimedia package which includes touch screen satellite navigation integrated into the sound system and a 20 gigabyte hard drive for storing music. It’s amazing this feature is not more common in even cheaper cars today. Bluetooth telephone connectivity is also included in this package although it’s far from the easiest and quickest to pair a phone to. The navigation could do some refinement to ensure better use of the screen, which at 16.5 cm, is a decent size and well located but deserves better content. Dual-zone climate control is also standard and cools the cabin well. The SRT8 also comes standard with keyless entry and go. The park brake is foot operated to engage. To disengage, however, you must use your hand to pull a separate lever mounted on the dash and, at the same time, use your left foot to control the release speed of the pedal. You can choose not use your foot, but the associated noise of the pedal springing back up is loud enough to make you not do it twice. Hopefully this process will be more efficient and refined in the next model. Whilst were at it, let’s request another basic efficiency – please include keyless entry to the fuel cap on the next model. Hard to believe in a time when some cars don’t even require you to remove a fuel cap, that you still need to use a traditional key to release the fuel cap on the 300C. Small gripe, but for a car that uses so much petrol, we think Chrysler can do better to ease the pain of refuelling. If you’re strictly a city driver, expect to be at the petrol station every 300 kilometres. The fuel tank capacity is 72 litres. 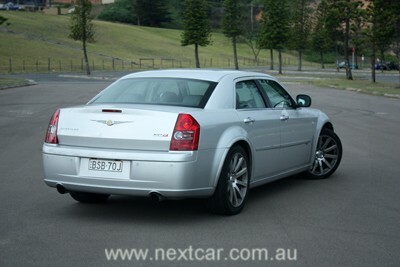 Thankfully, Chrysler Australia has tuned it’s pricing recently in favour of the customer. This includes Jeep, Chrysler and Dodge branded products which might interest you if were just out of range last year. 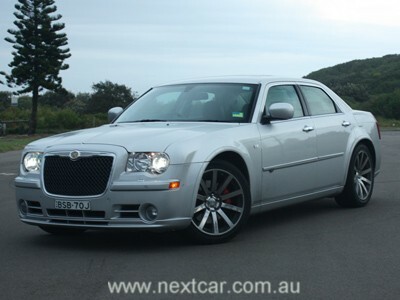 As a result of the price changes the entry level 300C is now available from $40,000* and the SRT8 is now priced at $65,000*. Our test car was fitted with a sun roof worth $2,600 as an option but the car was otherwise standard. Chrysler includes a warranty covering the 300C for 3 years or 100,000 kilometres, whichever occurs first. Chrysler has survived the global financial crisis and is looking positively to the future with new models on the horizon, together with the aforementioned attractive pricing structure (which is thanks, in part, to a strong dollar). A new generation Chrysler 300C is due to arrive in Australia next year and it is expected that a massive leap forward in terms of design and technology will be evident. Hopefully, the new range will include an SRT8! NOTE: * MLP (manufacturer's list price) excludes options, dealer delivery fees and the various statutory charges. 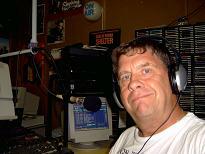 Additionally, all prices, fees, charges and specifications are subject to change without notice.